Unify your complexion with the Vichy Dermablend Colour Corrector, a creamy neutraliser that diffuses the appearance of unwanted imperfections. Each Vichy Dermablend Colour Corrector uses the power of colour theory to counteract areas of high colour in the skin, from redness and acne, to pigmentation and brown spots. Lasting for up to 24 hours of continuous wear, each creamy matte formula has a full coverage finish that feels hydrating and is easy to blend on the skin. Sweat-proof and water resistant, the Dermablend Colour Correctors create a natural makeup result and a beautifully unified canvas that lasts, ensuring a neutral base that’s ready for foundation application. Apply to moisturised skin before applying foundation. Dab a small amount onto the area you’d like to neutralise, then blend. 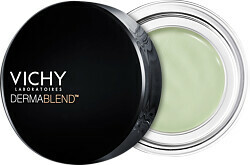 Vichy Dermablend Colour Corrector is rated 3.4 out of 5 by 5. Rated 1 out of 5 by Bellemorte from Disappointed Very dry. Impossible to blend. Didn’t cover the redness and didn’t last. Rated 5 out of 5 by SmokeJunkie from Green for concealer booster I am new to colour correctors and have always believed that they look easier on YouTube videos than for me to use in real life (if colour dyslexia is a thing then I probably have it as I need to be reminded of the colour wheel, every time). This Vichy Dermablend Colour Corrector was a punt for me: I've recently been getting red spots which take a few weeks to go away, and my experience of my trusty Vichy Ideal Soleil CC cream has given me confidence in the brand. I apply the green colour corrector with my ring finger onto the red spots. It is not that noticeable and, after a coating of the colour corrector, I will still be able to see the spots. However, the magic happens when I layer my usual concealer: either the corrector acts as a more adhesive base for my concealer, or maybe the colour wheel theory really does work, but the two combined does eliminate the appearance of my spots. The combination also works with dark patches (when the spots are nearly healed and turn a darker colour), even though I think this should really be a purple colour corrector job rather than a green one. With a dab of setting powder on top, the combination stays put all day (and night). I can't really compare this to the (now many) other colour correctors out there as this one is my first experience, but I am very happy with my purchase. Rated 2 out of 5 by Ooniewoonie from Good purchase Was excited to get this product however was disappointed that it’s coverage for rosacea and fine lines wasn’t sufficient. Rated 4 out of 5 by Alexa30 from Good product! I really like this product, it works well for dark circles under eyes and last for long.